Since my mom died, it’s been a real challenge celebrating the holidays without her. For many years I put up her tree and decorations as well as my own, and was cooking the Christmas dinner at my house so that she wouldn’t have the hassle or the work. After she stopped driving, I even took on the selection and purchase of the presents she gave to family at her request. As much as possible, I wanted to make things easier for her, and make her holidays a happy time. After she was gone, the idea of putting up my own full-size tree at the holidays suddenly felt like a waste of time and effort, as no one would be seeing it but myself, and there were so many memories associated with the twinkly lights and the smell of pine. But not decorating my house at all felt worse. I eventually talked myself into displaying at least a small tree, but nothing felt right. Then this year it was suggested to me that starting a brand new tradition might help lessen my sad feelings about missing the old ones. So I thought a lot about it and this week I decided I would try something completely different. 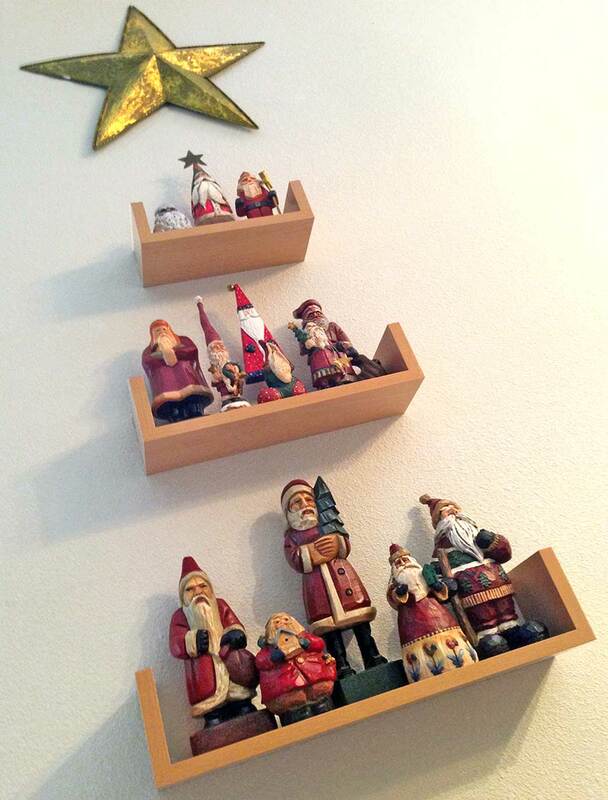 I took several of my favorite Santas from of my collection of about 150, some inexpensive floating wooden shelves from Target, and a metal star, and built a minimalist “Santa tree” on my living room wall. Planning and installing this gave me something entirely new to do, and I like the idea that I can change or rearrange the Santas if the mood strikes me. Under the “tree” is a small Lane chest where I’ve stacked the Christmas presents. Since this is a work in progress, I might add lights and some greenery later on, but even if I do nothing else, it still feels right. 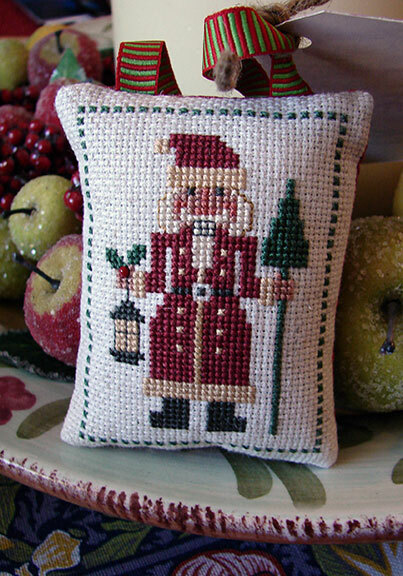 This year I also stitched little nutcracker pillow ornaments as gifts for both of my sisters. These are from a Prairie Schooler Nutcracker Santa mini-card design from 1996. The first is on 28-count Evenweave in Mushroom, the second is on 18-count Aida in Oatmeal, both in DMC floss as charted, although I added a border and changed the chart’s feet and belt slightly on the second version. 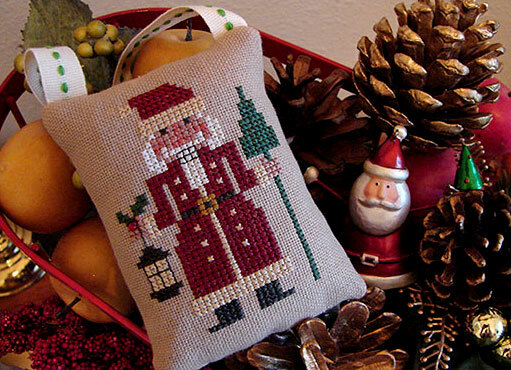 On both I substituted a red seed bead for the one stitch required to represent a holly berry. Prairie Schooler was for many years my favorite cross stitch designer, and although I’ve stitched plenty of their samplers and annual Santa cards in the past, this is the first time I’ve made up any nutcrackers. When I moved I found this very old project of mine in the closet rolled up in a tube and long forgotten! Judging by the date I’d stitched on it, I completed this 13 years ago (! ), and just never got around to framing it. Time does fly, doesn’t it? Maybe someday I’ll figure out exactly what I want to do with it. Decisions, decisions. I just hope it doesn’t take another 13 years for me to decide. Back when I used to collect Santa figures (which I don’t anymore, as I have around 200 of them and that’s more than enough!) I also used to collect the annual Prairie Schooler Santa charts. These four fellows made a nice grouping, I thought. Click on the image for a larger view. 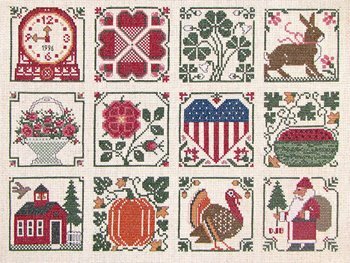 My sister and I both love craft shops and when I visited her we used to frequent The Primitive Sampler, a needlework store in Frederick, MD now long since closed. Sis still sends me patterns she picks up from time to time on her travels, the sweetie. 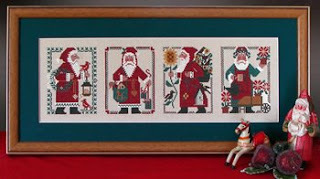 I lost the pattern for the Sunflower Santa in my last move eight years ago though, which is sad as he’s out of print now and I’ve always wanted to stitch another one of him. 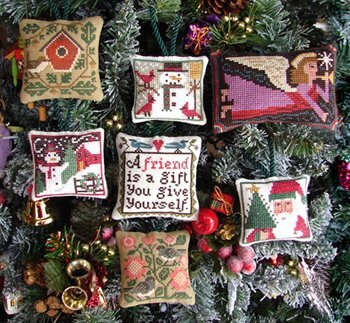 For Christmas 2008 I stitched a variety of small Prairie Schooler patterns on pieces of 14-, 18-, and 22-count scrap Aida cloth and finished them as tree ornaments. All of pillow backs were cut from medium-weight dark green cotton cloth, and I used silky green cording for the hanging loops. I secured the reverse of the stitching and attached cotton batting cut to fit to stabilize the backs. After stitching the little pillows together on the sewing machine I turned and stuffed them with polyfill, ladder-stitching closed the small gap I used for stuffing.